There are lots of great sewing projects, but very few of them are designed especially for kids. These ten easy projects are perfect for kids of all ages. Some require use of a sewing machine, while others need only a few basic hand sewing supplies. These ideas are a great way to learn new sewing skills and practice things you already know. 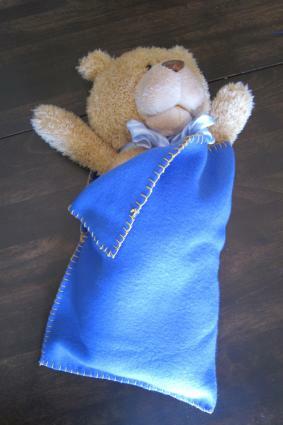 This simple sleeping bag is perfect for dolls and stuffed animals, and it's a great way to learn about working with fleece. It doesn't require a sewing machine - just a little practice with the blanket stitch. You can choose to make it larger or smaller to fit a certain doll or animal. Older kids can create this project independently. Younger kids may need a little help getting started with the blanket stitch. Fold the fleece square in half. Starting at the bottom folded corner, use pins to hold the two layers together. Continue pinning up the side. Stop when you get about half-way up the open side. Thread your needle with a piece of embroidery floss that's about two feet long. Tie a knot in the end. Starting at the bottom corner, bring the needle through both layers of fabric about a quarter inch from the edge. Let the thread loop over the edge and bring the needle back through the same spot again. You're ready to start your blanket stitch. Bring your needle through the loop you just made over the edge, and then push it down through the fabric about a quarter inch away from your first stitch. Leave the thread loose enough that you can slip the needle under it again. Repeat this process to make a blanket stitch. Keep making blanket stitches until you reach the spot where you stopped pinning, about half-way up the open side of the sleeping bag. Tie off your thread and cut it. Rethread your needle and make more blanket stitches. This time, you'll only be sewing through a single layer, leaving the sleeping bag open. Keep sewing around the top of the sleeping bag and down the side until you reach the place you started. Tie off the thread and cut it. Slip your favorite stuffed friend in the sleeping bag for a great night's sleep! 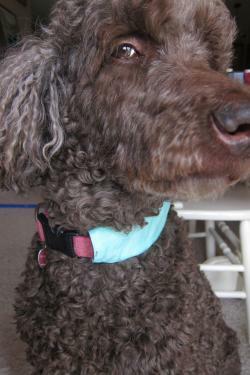 You can give your favorite pet a new look with this easy collar cover. You'll need to measure your pet's collar before you start, so younger kids might need a little help from a grown up. You can make this project with a sewing machine or by hand; it's up to you. First, measure the length of your pet's collar. Place the end of your tape measure next to the buckle and measure the length of the collar to the other side of the buckle. You won't be covering the buckle, so don't include it in your measurements. Add one inch to this length. Measure around the buckle of the collar at its widest part. Add one inch to the width. Cut your fabric scrap in a rectangle that is the length and width you found. Place the rectangle right side down on your table. Fold one of the short edges over two times, making the fold about a quarter inch wide. Use pins to hold it. Sew the edge using your sewing machine or by hand. Repeat step four with the other short edge. Now turn the fabric over so the right side is up. Fold it in half lengthwise, matching up the two long sides. Use pins to hold them together. Sew up the long side about a quarter inch from the edge. You'll now have a tube. Turn the tube right side out. If it's wrinkly, ask a grown up to iron it for you. Slip the pet's collar through the tube of fabric and adjust it so the buckle shows. Put the collar back on your pet and enjoy the snazzy new look. This cute bookmark makes a great gift for a friend or a teacher, and it's also a fun way to learn about sewing patterns. You'll need a printer to print the pattern. Younger kids may need some help from an adult. Start by printing the pattern. 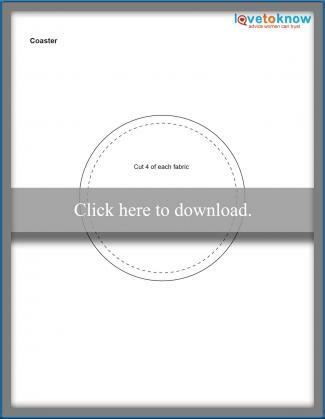 Simply click on the pattern image and either save the file to your computer, or print the .pdf directly from the reader. Click to print this pattern. Cut out the pattern. 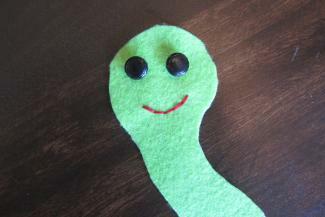 Use the fabric marker to trace the worm body pattern piece on your green felt two times. Cut out both of the pieces. Use the embroidery floss to sew a smile on one of the worm pieces, as marked on the pattern. Make sure you keep your knots on the back of the fabric. Sew the two small buttons on for eyes, using the pattern to help you figure out where to put them. Put the other worm body piece (without the face) under the worm with the face and line up all the edges. Use pins to hold the two pieces together. Fold the ribbon in half at an angle so it makes a "V" shape. Put the point of the V in between the two layers of felt at the top of the worm's head. The ribbon will be antennae. Use a pin to hold the ribbon in place. Thread your sewing machine with green thread. Sewing about 1/8 inch from the edge of the felt, go all the way around the edges of the worm. Stop when you get back to the place you started. Your bookmark is done! You can keep track of your pencils in style with this super-easy pencil case. You can make the case on the sewing machine or by hand; the choice is up to you. This case makes a great gift for a special friend or even for your mom or grandma. Lay the two-inch-wide ribbon on your table. Trim both the ends with the pinking shears. This will keep them from unraveling. Fold the bottom end up so that it overlaps the main part of the ribbon by six inches. Use pins along both edges to hold it in place. Hand or machine sew up the sides of the ribbon, as close as possible to the edge. Place a few pencils in the case and tuck the ribbon into itself to keep it closed. A pincushion is a handy tool when you're sewing, and it makes a great addition to your sewing kit. You can give it as a gift to a friend who enjoys sewing too. To make this cute owl pincushion, you'll need to print the free pattern. You can use the sewing machine or sew this by hand. This pincushion design is best for older kids, since it is a pattern with several pieces. Younger kids can make it with help from a grown up. Start by printing out the pattern. Just click on the pattern image to open the .pdf file and print it out. Cut out the pattern pieces. Click to print the pattern. Put the owl body pattern piece on one of your felt pieces. Trace around it twice with the fabric marker and cut out both pieces. Set these aside. Put the wing pattern piece on your other felt piece. Trace around it twice and cut both pieces out. Remember to use pinking shears on the top curve, as marked on the pattern. Set the wings aside. Use the eye pattern piece to cut out two circles of white craft felt. Do the same with the nose pattern piece and the yellow felt. Set these aside too. Put one of the owl body pieces face up on your table. 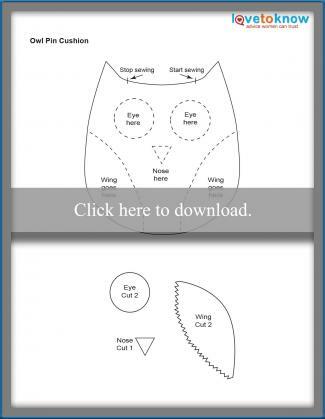 Lay the wing, nose, and eye pieces on the owl and use pins to hold them in place. Thread your embroidery needle with the yellow floss and embroider a small circle in the center of each eye. This will hold the eyes in place. Then move on to the nose and take a couple of stitches to hold it in place too. Use your sewing machine to make a line of stitches that follows the zig-zag curve of the wings that you made with the pinking shears. Repeat with the other wing. Stack the owl front on top of the other owl body piece. Pin all the way around the edge. Sew most of the way around the owl, but leave a small opening near the top for stuffing. Push stuffing up into the owl using the chopstick. When the whole owl is stuffed, sew the opening closed. If you know a baby and want to make a special gift to welcome him or her, this is a great project for kids to make. This design is a little more complicated, so it's better for older kids who have done a little sewing before. The pattern makes this project easy, and you can use any fabric and color of ribbon. Before you give the toy to the baby, have an adult check it to make sure everything is sewn on really well and is safe for the baby. It's best to make this hedgehog on the sewing machine. Click on the image of the pattern and print it out, then cut it out. Trace around the hedgehog body piece with the fabric marker and cut two out of your fabric. Use the embroidery floss to sew an eye and a smile on each of the hedgehog body pieces in the spots marked on the pattern. Cut your ribbon into pieces that are about three inches long. You'll need enough ribbon to go up over the hedgehog's back. The number of pieces will depend on the width of the ribbon you choose. Fold each three-inch piece in half and use a pin to hold it that way. Put one of the hedgehog body pieces face up on your table. Arrange the ribbons along its back so they are pointing down and the raw edges are lined up with the raw edge of the fabric. Use pins to hold them. Sew right along the raw edge to hold the ribbons in place. Take out all the pins. Put the other hedgehog body piece on top of the body piece with the ribbon, making sure the right sides are together. Use pins to hold them in place. Sew all the way around the hedgehog, except in the spot marked on your pattern, keeping your stitches about a half inch from the raw edge. 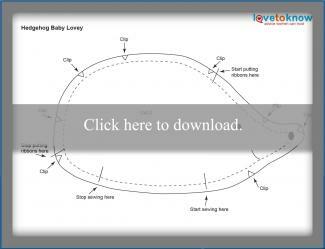 Use your scissors to clip all the curves on the hedgehog, as shown on the pattern. Turn the hedgehog right side out through the opening. Have an adult help you iron the hedgehog. Sew the opening closed. Use the embroidery floss to add a nose for the hedgehog. You can make a set of felt coasters as a gift or just to protect your bedroom furniture. This project is great for kids just learning to sew, since it uses very few materials and is easy and fun. Younger kids may need a little help cutting the fabric and operating the sewing machine. Click on the pattern to open the .pdf file. Print the design and cut it out. Trace around the pattern four times on the felt and four times on the cotton fabric. Cut out all the circles. Put one felt circle on your work table and place a cotton fabric circle face-up on top of it. Use pins to hold the two pieces together. Use your sewing machine to sew around all the way around the circle, about half an inch from the edge. Repeat with the other three felt circles and cotton circles. Use the pinking shears to make a zig-zag edge on all four coasters. You can wear this project to school to show off your sewing skills. This simple belt makes a fun project for kids of all ages, and you can choose any color or style of ribbon you like. It's strongest if you make it on the sewing machine. Start by measuring your waist. Thread the tape measure through the belt loops on your pants, just like a belt. When you find out how wide your waist is, add eight extra inches for this project. Turn one of the ends of the ribbon under two times and hold in place with a pin. Sew over the end to hide the raw edge. Thread the D ring on the other end of the ribbon. Slip it down to about an inch from the end and turn the other raw edge under. Hold it in place with pins. Sew over the spot you pinned. 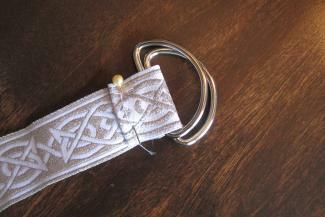 To wear your belt, put the end through both D rings and then thread it back through only one of the D rings. This super easy wallet is a fun way to learn how to use the zig-zag stitch on your sewing machine. Kids of all ages can make this fun design. Turn your craft felt so one of the short sides is facing you. 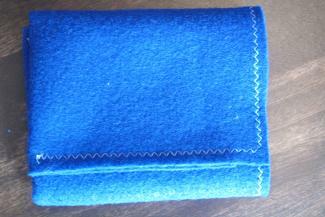 Cut about seven inches off of the end of the felt so you have a rectangle that's about seven inches by eight inches. Fold the longer side of the rectangle up so that it overlaps itself, leaving about one inch that is showing. Use pins to hold it in place. Set your sewing machine to a zig-zag stitch. Starting at the bottom corner where the felt is folded, sew all the way up the side, over the top, and down the other side. Fold your wallet in three and have fun using it. 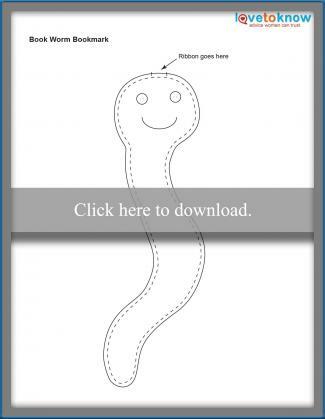 You can make an adorable stuffed snake without a pattern. All you need is a few supplies and a little time. This snake is an easy project for older kids, and it's best to make it on the sewing machine. Cut a rectangle of fabric that is 18 inches long by four inches wide. Fold the rectangle in half, matching up the long sides. Make sure the right sides of the fabric are together. Use pins to hold the fabric in place. Sew up the long side of the fabric to make a tube, keeping your stitches about a quarter inch from the edge. When you are done, take out all the pins. Use the disappearing fabric marker to make a pointed tail for the snake. Sew along the line you drew. Trim the fabric to match the pointed tail. Use the chopstick to turn your snake right side out. Stuff it with the stuffing. Cut a "V" shape out of the end of the ribbon. Fold over the raw edge of the snake and put the straight side of the ribbon between the layers of fabric. Tuck the corners of the snake fabric in to make a rounded head. Hold everything together with pins. Sew right along the edge of the opening to close up the snake and hold the ribbon tongue in place. Hand sew the two buttons on the snake for eyes. If you're just learning to sew, there are lots of great beginner sewing projects you can try. It's rewarding to learn more about sewing as you make something special for yourself or for a friend.